Google has just evolved their cover photo specifications for Google Plus pages, giving us much more space to work with! The new dimensions are so large that we had to create a new image, because our old cover photo ended up becoming blurry from up-scaling it. After doing a quick search, I found out that the maximum size your image can be is 2120(w) X 1192(h) pixels. Please note: This was way too large, and slowed down the load times for our business page, so I don’t suggest using the maximum size. The size that I suggest using for a new cover image for Google’s page is half of the maximum size. The minimum size is 1060(w) X 590(h) pixels. The new layout does have a black transparent gradient, which is located behind the profile image and information that displays at the bottom of your cover image. If you are using a call to action within your cover photo, I suggest placing all of this information above this gradient. I estimated that the height is roughly about 150 pixels. Keep in mind the Google page is responsive to the resolution size of your screen, and this is why I decided to go with 150 pixels. Below is a diagram I created for you to use when you design your new cover photo for your Google personal or business pages. 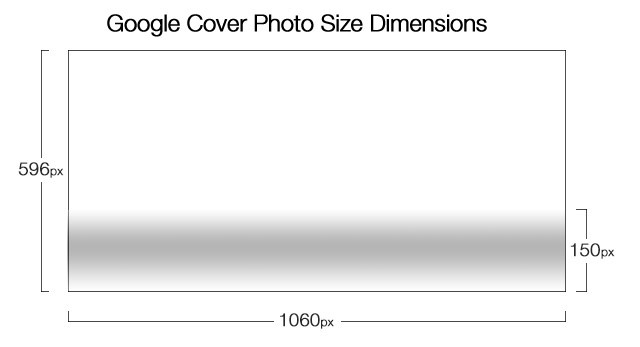 Here is the dimensions I used to create our new Google Cover Image. That’s right! You can create an animate gif to use for your new Google plus cover image. We took the extra time to make our page stand out, and we suggest that you do the same. What do you think about our new Google Plus cover image? Our goal is to achieve a very similar design like our new website’s.